It’s December 1st, and the holidays are approaching. 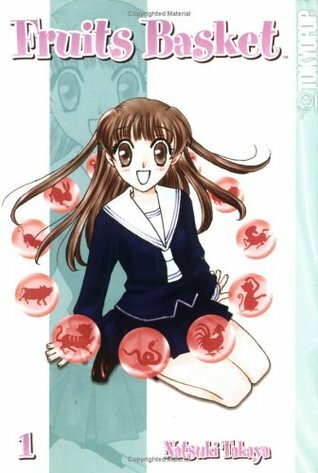 It’s the season of fruitcakes and overpriced gift baskets, so I’m celebrating by doing my first diaries series on Fruits Basket, one of the most popular shoujo series of all-time. So celebrate the 25 Days of Fruits Basket with me! For my Fruits Basket diaries, I will have comments that I jotted down as I was reading accompanied by page numbers. Page numbers are based on the original Tokyopop printed versions. (UPDATE: Yen Press has just acquired the Collector’s Edition [aizouban] versions, so page numbers and art may differ slightly.) At the end, I will have my overall thoughts on the volume. Of course, my series will start with my pre-read thoughts and ends with my final thoughts. So that’s one post per day until Christmas. Come and share the holidays with Tohru and the Sohma family. (c)Takaya/Studio Deen. Image from Pinterest. Original image from magazine, wallpaper done by ???. Reasons for doing a diaries series for Fruits Basket: #1, #4, #5. It’s definitely a well-loved series! I watched the anime and really liked it. I then decided to read the manga, but by that time, the volumes seem to have gone out of print. Makes me sad! Maybe now that it’s being published in an aizouban format, a company will pick it up since they’ll only have to release 11 or 12 volumes instead of 23. I know, I just saw it! It’s the third (?) time I think (BroCon Vita port, Orange manga, Fruits Basket) something I wrote about got an announcement. Was going to do Akatsuki no Yona too just before Viz Media got it.